Deborah Karp, MD, leads the Pelvic Health After Pregnancy Clinic, located at Emory University Hospital Midtown. Emory Clinic's Department of Gynecology and Obstetrics is proud to announce the opening of the Pelvic Health After Pregnancy Clinic, a new and unique subspecialty clinic for postpartum women with pelvic floor concerns. 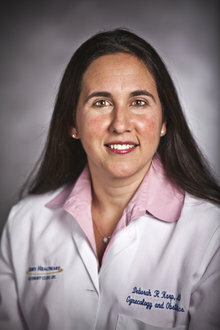 Deborah Karp, MD, assistant professor of gynecology and obstetrics at Emory University School of Medicine, will lead the specialty clinic, located at Emory University Hospital Midtown. Karp is fellowship-trained and board-certified in Female Pelvic Medicine and Reconstructive Surgery. "Becoming a mother is a wonderful experience," says Karp. "Women should be able to focus on getting to know their babies in the postpartum period, not worry about dealing with embarrassing or uncomfortable issues that result from pelvic floor changes." The clinic also offers counseling for women with previous or existing pelvic floor disorders who are planning on a pregnancy in the next year, and desire consultation regarding the impact of future pregnancy and delivery on the pelvic floor. "Our service will allow obstetricians to focus on postpartum needs, such as breastfeeding and contraception. We will provide the early assessment and treatment of pelvic floor problems resulting from childbirth in postpartum women. We can offer a range of therapies that can help women regain control of their pelvic floor," says Karp, emphasizing that once the immediate pelvic issues of the patients are addressed, the patient will be directed to return to her provider for continued obstetric and gynecologic care. To find out more information about the Pelvic Health After Pregnancy Clinic, or to schedule an appointment, call 404-778-3401.